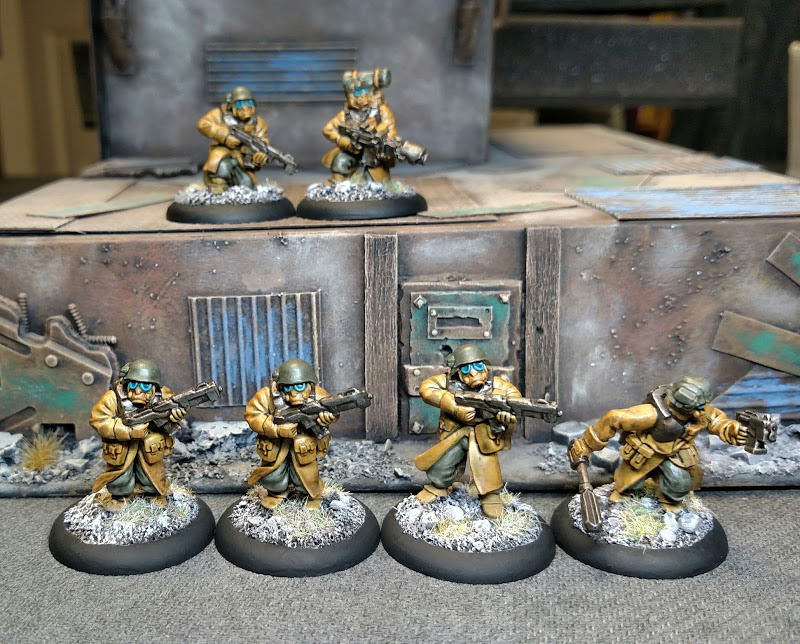 A couple years ago, I got my hands on a big ol’ box of gorgeous sci-fi infantry figures from Pig Iron Productions. Now, if you know me, you’ll know that I’m a sucker for anything by Pig Iron. 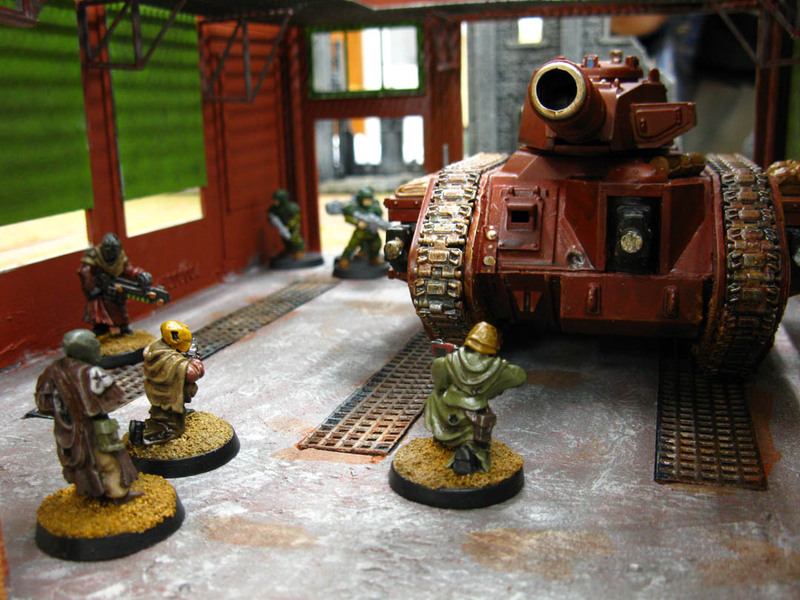 The gritty, near-future aesthetic of the figures aligns perfectly with my sci-fi wargaming interests. 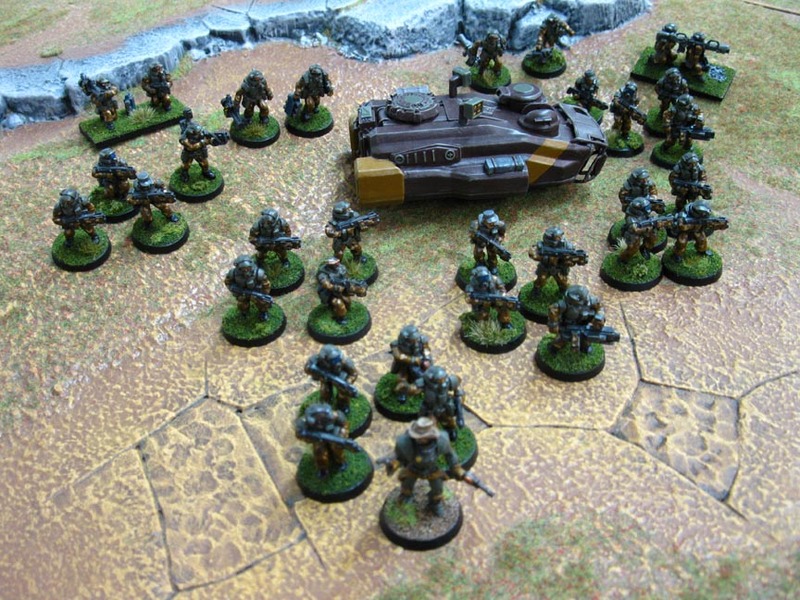 I’ve already got a big skirmish army built from Pig Iron’s Heavy Infantry figures, as well as a hefty group of the totally awesome Kolony Ferals. This new lot included 30+ Kolony Militia figures. These guys have greatcoats and gas masks and military gear, and they look fantastic everywhere I’ve seen them. 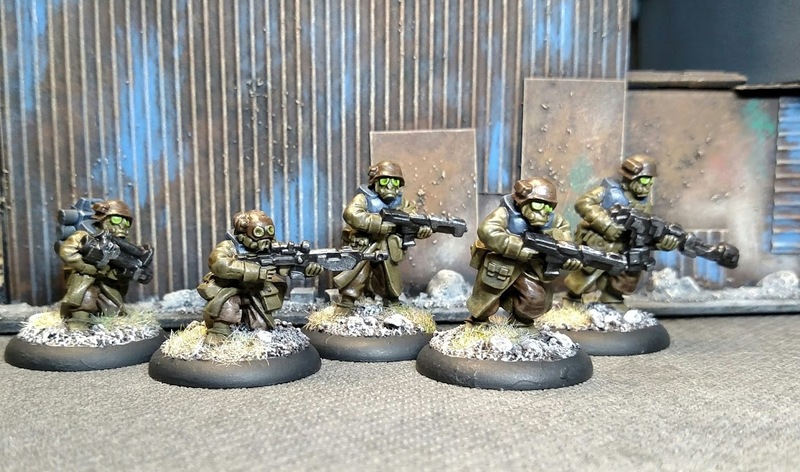 The militia guys were unpainted, and they sat in a box at least a year while I fiddled around with other projects. I finally got started painting them last summer. My goal is to do small groups in different paint schemes, so they can be used on their own as warbands, or as squads in a larger army. Here are the first two groups. I’m not sure what to call them — either half-squads or reinforced fire teams, or something similar. And just for fun, here are a few more sci-fi figures I finished up recently. 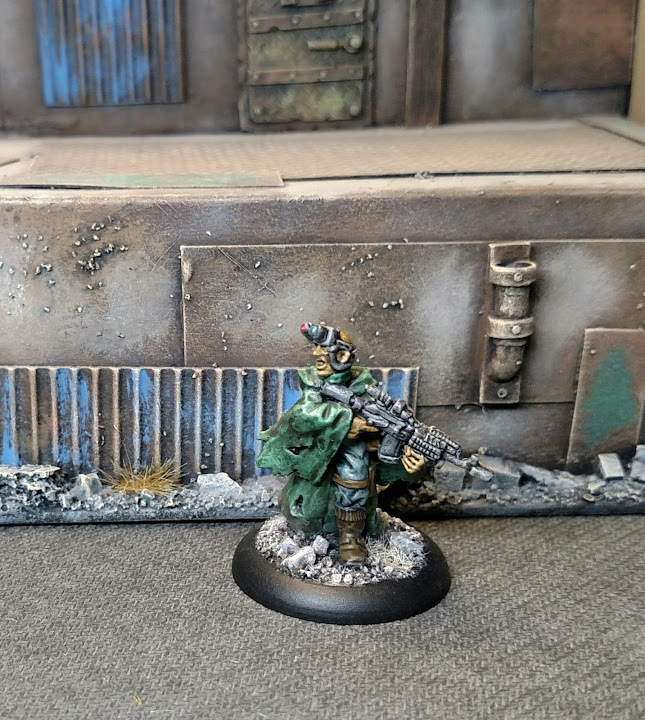 This guy is from from Ratnik Miniatures (via Lead Adventure Miniatures) … he is called an “assassin,” but he could easily work as a squad leader, sniper or forward observer. 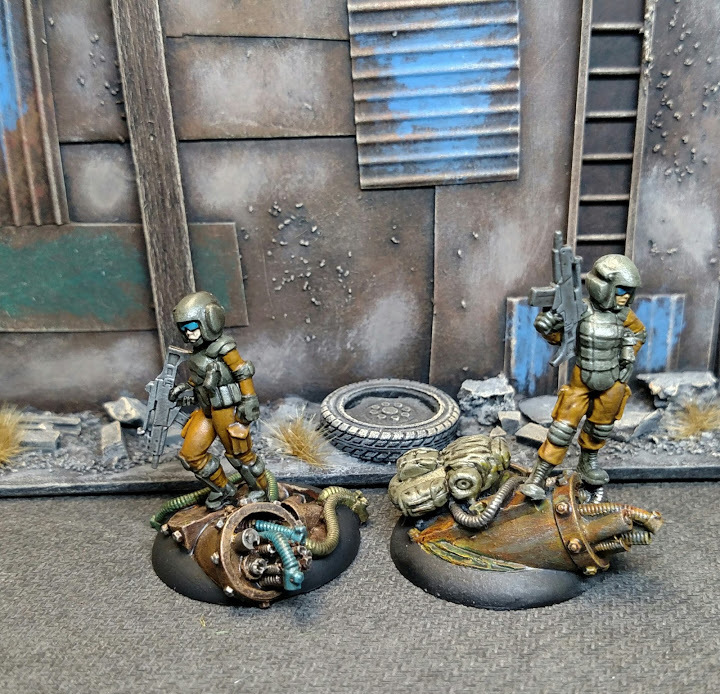 These are a couple female troopers from Hasslefree Miniatures. I really like them because they don’t have the typical ostentatious armor and crazy proportions that characterizes the female form in most miniatures. Their armor and poses look fairly functional and realistic. And lastly, we have three character models perched atop some really amazing resin bases that I picked up last year. The resin bases were unpainted, unlabeled and I have no clue where they came from. 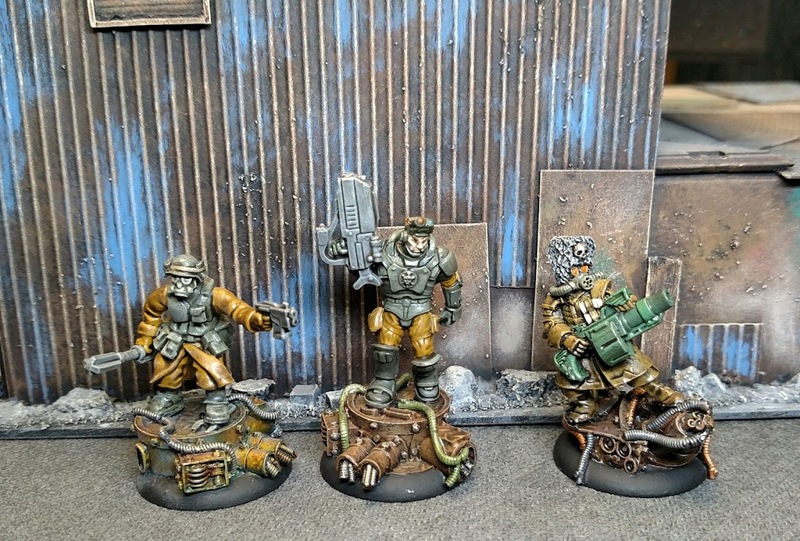 The figures themselves are (from left): Pig Iron Kolony Militia, Reaper Chronoscope (trying to be a Gears of War guy) and Warhammer 40k Vostroyan (some of my favorite recent 40k sculpts).